Renowned for their Rieslings, Michigan’s wineries have made it the most planted grape in the state. 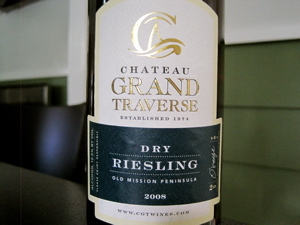 But no winery has embraced the variety as much so as Chateau Grand Traverse. Established in 1974, the winery is credited with the first commercial planting of European vinifera grape varieties in Northern Michigan. Often referred to as the largest Riesling wine producer east of the Mississippi, the winery brings more than 35 years of experience to the table. The second largest winery in the state, Chateau Grand Traverse produces approximately 95,000 cases of wine a year from 120 acres, while purchasing another 60 acres of grapes from other growers on Old Mission Peninsula. The winery produces 7 award-winning Riesling wines including tonight’s wine, the Chateau Grand Traverse 2008 Dry Riesling. Paired alongside lemon and herb crusted tilapia, the dry, crisp wine proved to be a perfect match. A refreshingly crisp wine, aromas of green apple, pear and citrus were prominent on the nose. On the palate, nice slate and mineral notes shine through, followed by apple and lemongrass. A delicious effort that delivers great value at $12.50. Cheers! Love the video! There are lots of undiscovered winery gems in Northern Michigan.